I usually share what we have been doing after the fact but since the Olympics kick off tomorrow I thought you might want to join in the fun. 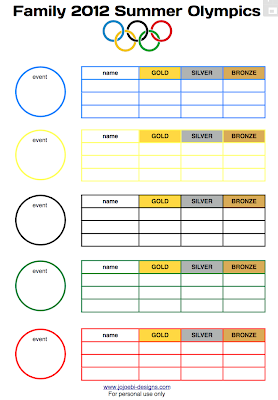 I made up a PDF so that you can make up your own family Olympics. This afternoon we will decide which 'events' will take place in ours. Hoopla is definitely on the list but I'm not sure what else yet. So, print out the sheet, you might want to print out a few copies, write in the events, they can be as serious or as silly as you like, we will probably be leaning towards the silly side, then pop them on the fridge or up on the wall. When you have one of those 'I'm bored' moments, pick an event and go for it. When you plan your events make sure you include ones that even the littlest kids can win. As you know the actual Olympics will be running over the course of a few weeks, you can do the same with your family Olympics. 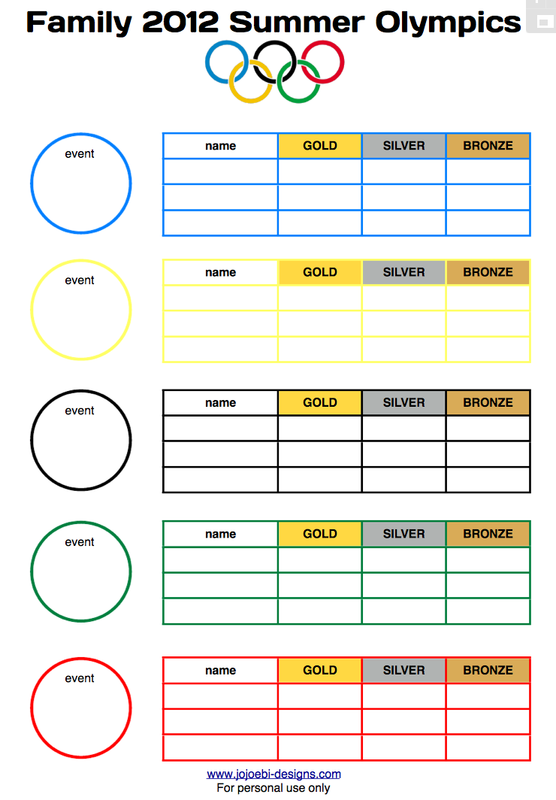 Record who has won what and either award medals as you do the events or have an award and closing ceremony at the end of the holidays. What fun events will you be doing? Share in the comments section below and if you have friends that you think would like to join the fun please share this post! If you don't want to miss out on all the other fun ideas I share, hop in the mailing list, it's FREE! I like this idea! My son has been in Olympic mode since the first week of June. They had Olympic games at his school. Kids were assigned countries to represent (Germany for my son), then spent 2 days with their teacher learning about their country. He was so excited we even cooked a German dinner one day. The games had opening ceremonies and events that included among others: hula hoop, discus, running, jumping and javalin (they used pool noodles). Everyone absolutely loved it and I know my son learned quite a bit. It was one of the best things our school has done. wow, that sounds like great fun. Ebi-kun isn't that excited about it yet, I am hoping we can catch some of it on TV to get his interest up, I think part of the problem is that he knows what it is but hasn't seen anything and there isn't the hype here. He does like the idea of doing an event each morning with daddy before he heads to work - not sure what daddy is going to think of it!